My conclusion in my Skeptic’s Apple Watch diary series was that the device didn’t really have a unique selling-point to me, but was a slightly more convenient way to receive notifications. Ultimately, though, I kept it because it was a cool gadget. 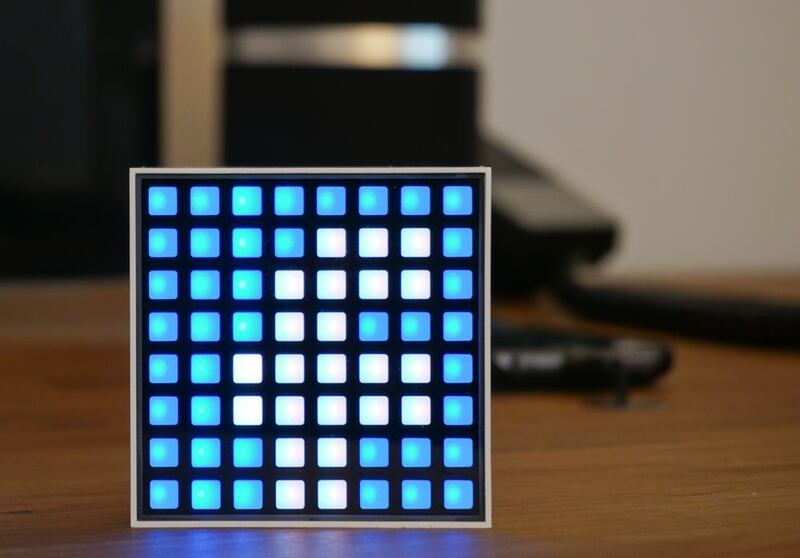 Dotti is a 6.5×6.5x3cm white box with a display on the front comprising 64 multi-color LEDs in an 8×8 grid. When your iPhone receives an alert, the companion app sends a Bluetooth message to Dotti, which then displays a flashing alert. For example, here’s the alert for Twitter. 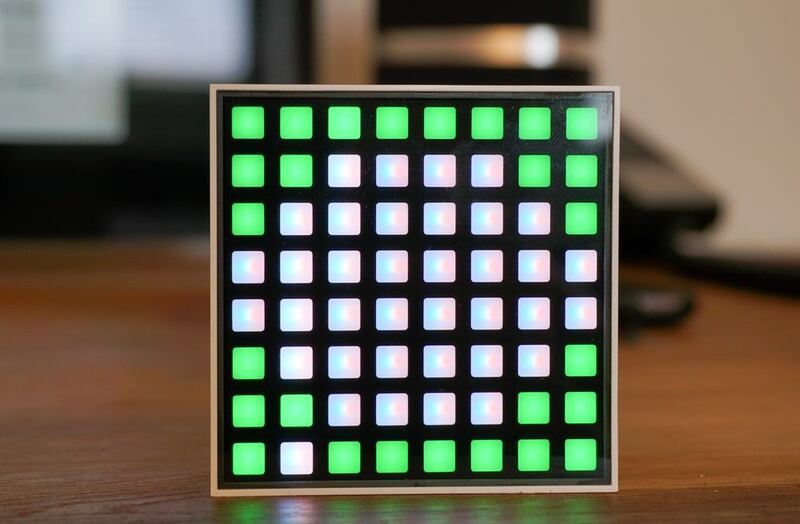 Incidentally, the device sequences the LEDs, so not all are on at any one time. This makes the display hard to photograph, and even when you use a shutter speed slow enough to capture all dots on, it looks a lot less clear in a photograph than it does in reality. In use, the t for Twitter shown above is very clear. 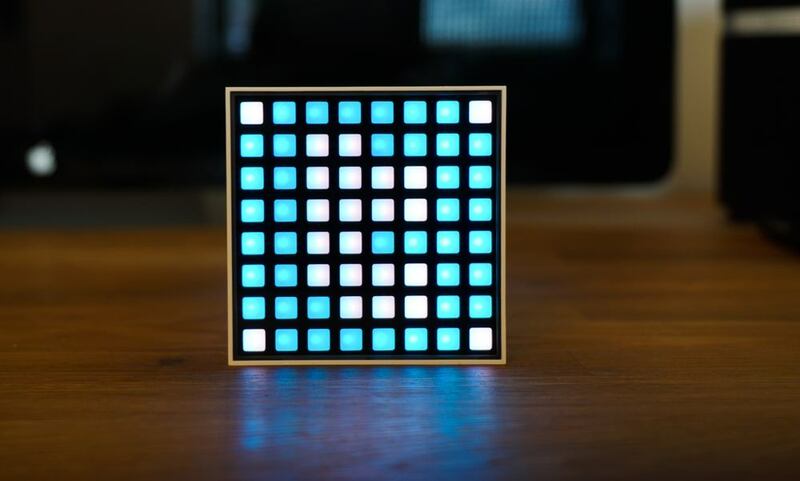 Notti is a simpler device, a kind of iceberg shape measuring 10×7.5×6.5cm. 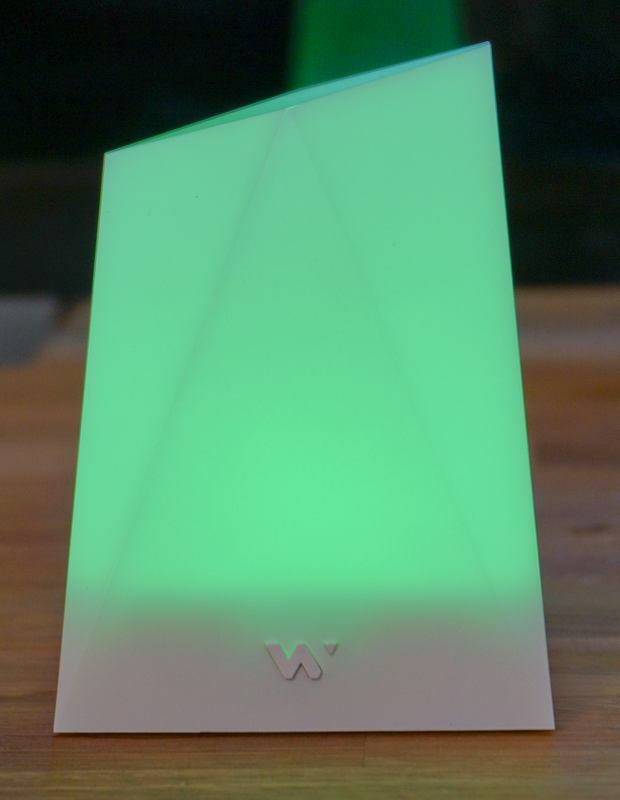 There’s no display on this model, just multicolored LEDs tucked away inside which light up a solid color when a notification is received. Text messages or iMessages, for example, cause it to light up green. The companion apps allow you to chose which alerts you want. Both devices offer a choice of five built-in apps – SMS/iMessage, phone call, missed call, mail and calendar alert – plus thirteen third-party apps: Facebook, Facebook Messenger, Twitter, Whatsapp, Skype, Instagram, Viber, IFTTT, Google+, Wechat, QQ, Line and Weibo. Once you select the alerts you want, the app synchronizes data with the device, during which time it runs through the range of displays/colors on the device. …others are rather less obvious. I’m not sure this one would be remotely obvious without the cribsheet from the app, for example. (It’s a text message/iMessage). 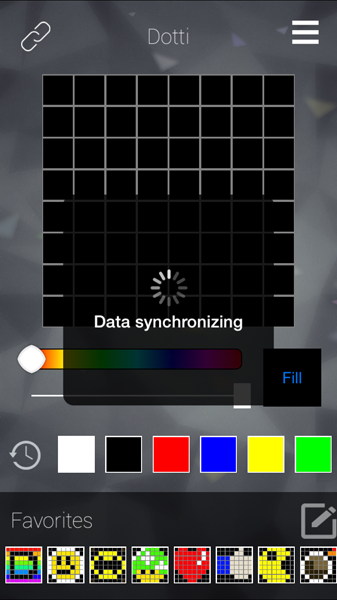 With Notti, the problem is worse as you just have solid colors to go on (though you can choose them yourself). 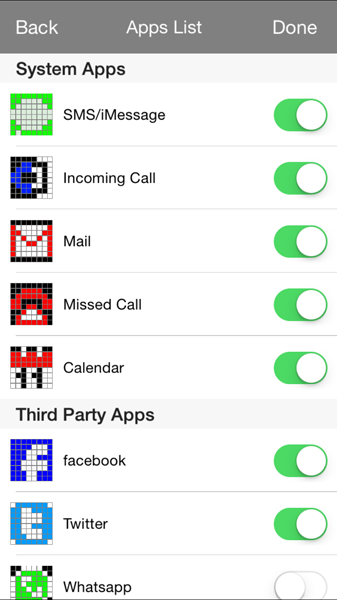 Some of Dotti’s icons are not very obvious by the shape, but the color makes them recognizable – like calendar alerts. My view is that you’ll likely be fine if you stick to a small-ish number of alerts, but would have little chance of recognizing them all without far more concentration than is sensible for what is really just a bit of fun. At present, alerts continue to flash until you cancel them by touching the hidden touch-sensitive panel on the top of Dotti, and pressing the front button on Notti, but the company plans a firmware update so you’ll be able to choose how long an alert displays before auto-cancelling. Clearing the notification on your iPhone also cancels alerts on both devices. 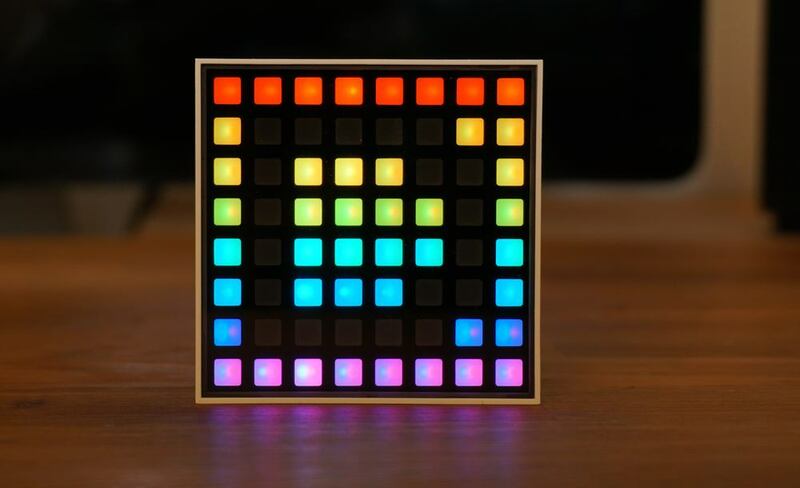 Both devices offer other functionality – like changing color in time to music played through the iPhone, and drawing your own icons which can be saved and redisplayed later. I could definitely see the latter feature keeping kids quiet for a while. With Notti, you select the function in the app; with Dotti, you can also swipe through the different functions by swiping the top of the box. Battery-life is excellent, both devices claiming 720 hours on standby or 5 hours of display. I didn’t use either enough to test the standby claim, but both devices made it through an evening with the display/lighting constantly on. The internal batteries are recharged via microUSB cable. I think the only people who could justify either device as anything more than a toy are deaf people, where a very obvious visual alert could be extremely helpful. For the rest of us, it’s a gadget. I could definitely see them as conversation-starters in an office or home, and I do think younger kids will enjoy creating their own drawings on Dotti. The question is how long it would be before the novelty wears off, and whether that justifies the price. For me, I’m sticking to my Apple Watch notifications, but they are definitely fun toys. Dotti costs $79.99, while Notti costs $59.99.